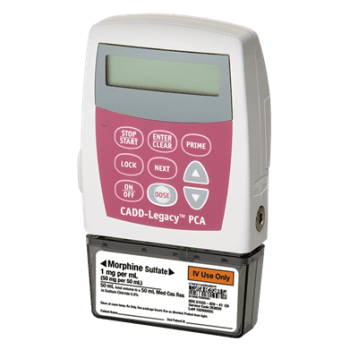 CADD-Legacy® PCA Ambulatory Infusion Pump, Model 6300 for continuous clinician-activated bolus and patient-activated bolus infusions. The CADD-Legacy® PCA pump is for pain management therapies… because performance runs in the family. Includes pump, single-use 50-/100-mL pump pouch, 2 AA alkaline batteries, non-sterile demo cassette, CADD® key, operator's manual, patient guide and carrying case. CADD-Legacy® PCA Pump Model 6300. 21-2165 Reusable 50-/100-mL Pump Pouch. Accommodates pump with 50-/100-mL medication cassette reservoir. 21-2170 Single-Use Black 50-/100-mL Pump Pouches. 10/box. 21-2171 Single-Use Black 250-/500-mL Pump Pouches. 10/box. 21-2185 CADD® Pump Key. Compatible with CADD®-Solis, CADD-Prizm® and CADD-Legacy® pumps. 21-6120 Lockable Polemount Bracket (requires Polemount Adapter 21-6210). 21-6165 Modiﬁed Security Shell. Requires Security Shell Adapter (21-6212). 21-6216 Battery Door for the CADD-Legacy® pumps. 21-6220 Remote Dose Cord for the CADD-Legacy® PCA pumps. 21-6235 Protective Cassette for use with CADD-Prizm®, CADD-Legacy® and CADD®-Solis pumps; protects pumping mechanism and sensors during shipping and storage. 21-6287 Large LockBox with Full Keypad, Air Detector Access. Compatible with standard IV bags up to 500 mL and preﬁlled syringes up to 60 mL.